Kezarlife's Blog | Lovell, Maine & Beyond! 2019 sure doesn’t look like a strong year for the Orioles but with a new manager, Brandon Hyde, Mike Elias as the new GM and lots of young players, hopefully there will be significant improvement from last year’s historically bad team. Manny Machado stays on the west coast with the San Diego Padres and Bryce Harper travels north on I-95 to Philadelphia to play for monster money with the Phillies. Oh yeah, I almost forgot, the Boston Red Sox are the defending World Series Champions. Another pennant will soon be flying above Fenway Park. With their strong core of young stars, the Red Sox should have another solid year. Maybe not as dominant as last year, but still strong enough to take the AL East. It would be nice if they would let the O’s win a series or two. Opening Day is approaching fast. The Sox open in Seattle on March 28th where the weather should be a little better than New England. The schedule magnets are here and are in various stores around Lovell. Don’t hesitate to stop in at the office and pick one up or I would be happy to mail you a schedule. Just send me an email at stan@kezarrealty.com. Nothing like a couple of hot-button issues to draw a record crowd to Lovell’s historic Town Hall for the Annual Town Meeting on March 2nd. Close to 150 people were in attendance with many forced to stand throughout the proceedings as all of the seats were occupied. Months of Planning Board meetings, a public hearing and a citizen’s petition led to a vote on whether the town should retain Lovell’s more restrictive shoreland zoning issue or to revert back to the state’s minimum standards. Moderator Jon Bliss orchestrated an orderly discussion in which proponents from each side of the issue were permitted to speak. Voting was by paper ballot and with a vote that was not very close (76-50), residents voted to retain the town’s more restrictive shoreland ordinance. A proposed zoning ordinance to prohibit all retail marijuana establishments generated some discussion but, in the end, was approved. The new ordinance prohibits all retail sales as well as any cultivation. There was a very close vote for the open selectman seat vacated by Turf Ramsden. A difference of only five votes separated the two candidates. Retired tax collector Janice Arsenault won with 68 votes while Jack Jones garnered 63. All in attendance gave Turf a rousing round of applause to thank him for his years of service. The remaining articles met with minimal discussion, were approved quickly and the meeting was over by 12:30. Still plenty of time to enjoy a beautiful winter’s afternoon. Another Lovell Town Meeting in the books. The ‘Save This Place’ column highlights an older property that is worth preserving. I remember the day so well. It was back in the summer of 2015 that I received an unsolicited phone call from a Donna J. Snay in South Paris. Donna was a REALTOR® who was ‘interviewing’ real estate agencies after the one she was with closed down. We made an appointment for her to come to Kezar Realty for a visit. Based on our geographical distance, I thought it was a bit unusual for her to contact a Lovell Agency. She mentioned that she always took note of our four-color ads in the Buyer’s Guide and thought that we would be a good place for her to hang her hat. Donna was a person who never hesitated to go after business. She enthusiastically solicited FOR SALE BY OWNERS, expired listings in addition to letting everyone know that she could sell their home or assist them in buying a new one. Now, everyone who works in sales knows how difficult it can be to ask a stranger for their business! But she completed successfully a number of transactions which originated with such contacts. A very private person, Donna did not discuss too many things unrelated to business. She loved her family, especially her grandchildren. Rest in Peace Donna. You will be missed. The 2019 ‘fully magnetic’ Kezar Realty calendars are hot off the press! Feel free to stop by the office for your very own copy or pick one up at some of the local stores. Not in Lovell? Send me an email at stan@kezarrealty.com and I will be happy to send you one or two in the mail. For the past two years, some eagle-eye folks have spotted an error or two on our calendars.Minor things like the dates starting on the wrong day of the week or November having an extra day but not very helpful if you want to use the calendar for planning purposes! Well, this year, our printer, Nat Beal at The Write Stuff and myself, took extra time to make sure that there were no mistakes. I can now certify that the 2019 Kezar Realty calendar is 100% accurate! The same cannot be said for a local bank that uses local photographers’ photos each month (including Lovell’s Pam Bliss in May). I was using their calendar to proof my draft and discovered that they cut December short by one day! I sure did enjoy pointing out to them their mistake. Thanksgiving came early this year and so did the snow (and the snow kept coming and coming!) That equates to extra time for shopping. Normally, that means making trips to the mall in South Portland or to the outlets in Freeport, Kittery or North Conway. To make your 2018 holiday season more enjoyable, my suggestion is to shop local. We often overlook all of the wonderful merchants, artists and non-profits that we have living in and around Lovell. Not only will the recipient be pleased but by buying local, you will be supporting our local economy. * Lots to choose from at the Harvest Gold Gallery in Center Lovell. Custom designed earrings, bracelets, necklaces, rings and much more. Inside their large gallery is a wide variety of American-made art work (much of it local) that will brighten every home. Bill and Lynda can be reached at 207-925-6502. Visit their website here. * You need to check out all the great things that Brent Legere is creating at the Lovell Box Company. The list of products continues to grow but still includes the wonderful, one-of-a kind boxes and crates (perfect for wine, beer, storage, produce, etc.) made from pine on the family land. Have an idea for a custom design, Brent would be happy to make something from your own specs. Check out his Facebook page here or call him at 207-432-2900. * How about taking that old couch with the ragged threads to HEIRLOOM UP for some updated upholstery? How about some custom throw pillows to add some style to your existing furniture? Visit Martha Livingston’s shop at 222 Main Street in Lovell Village. She can help you with design and fabric choices and then do a fantastic job of bringing your favorite chair or couch back to life. Is your pontoon boat looking tired? Martha can help spruce it up with new seat covers! Call her at 207-595-1539. * Find a great selection of lumber, paint, nuts and bolts, mulch, wood pellets, pet and horse feed, propane, garden supplies and much more at the Lovell Hardware Store at 411 Main Street. If they don’t have it, they will order it for you! Wouldn’t your talented home carpenter friend appreciate a gift certificate? Call 925-9053 for hours. * Can’t find a friendlier family than the Wards from Stow! Justin and Jenn’s ‘Off the Grid’ Fly Away Farm is now firmly established in Lovell and the surrounding area. It may not be the best time of year for fresh produce but there is a great selection of handmade jewelry, bags, t-shirts and don’t forget the delicious eggs, pork, honey and maple syrup. Visit their website here or give them a call at 466-7352. * Karl’s Auto Repair is located at 118 Cushman Pond Road in Lovell. Get rid of that winter grime inside and out for your special person’s car with an auto detailing package from Karl. Call for more information at 928-3132 or visit Karl’s Facebook page here. * Hilltop Handspun, located in North Lovell, is owned and operated by fiber artist and designer, Lucy Rogers. Lucy enjoys creating and selling had-made yarn to hand knitters and fiber and roving to hand spinners and felters. The yarn and spinning fibers are made from alpaca mohair, wool and angora fleeces that she hand selects from Maine and New England fiber farms. Many of her designer yarns are hand spun and a number are spun at a local mini-mill on a fleece by fleece basis. Beautiful colors in the yarns, which are inspired by the local mountain environment, come to life during the hand dyeing process in Lucy’s kitchen. Here is a link to her webpage where you will find yarn and kits for sale. * Pietree Orchard. Located on top of Waterford Road in Sweden, this Orchard is a great place to shop for local produce, pies, flowers, doughnuts, jams and outstanding pizza! The ‘Pick-Your-Own’ season is over but there is lots to choose from in the store including some fashionable hats and shirts. Plus they are great contributors to our local community. Visit PietreeOrchards.com for more detailed information. 647-9419. 1) Rosie’s Lovell Village Store. What better place to eat the counter and catch up on local activities. Stop in or call Rosie at 925-1255. 2) The Center Lovell Market. Open on a year-round basis for great food, coffee, a bottle of wine, gasoline and some sharp looking hats and shirts. Great pizzas! 925-1051. 3) The Stow Corner Store. An original menu, great portions, a very warm environment and a local institution to boot! Checkout their Facebook page here for updates on specials and hours. Don’t miss the award-winning chili and seafood chowder! Worth a visit for that alone. 697-2255. 4) The Wicked Good Store. Be sure to try out some great food at the new store in town! 925-9087. Visit their Facebook page here. 7) Ebenezer’s Pub. Who would ever think that America’s Best Beer Bar in here in Lovell. On the second green of the Lake Kezar Country Club, the pub also has easy snowmobile access to their front door during the winter. Visit their Facebook page here. Hours vary according to the season so be sure to call first. 925-3200. Still can’t figure out what to give to someone who has everything? How about a gift in their name to some of our local organizations? The Charlotte Hobbs Memorial Library, Lewis Dana Hill Memorial Library, Lovell Historical Society, Brick Church for the Performing Arts, Greater Lovell Land Trust, Kezar Lake Watershed Association, Sweden Food Pantry, Lovell’s United Church of Christ, Sunshine Backpack Food Program, or Lovell Friends Helping Friends (winter fuel assistance for the needy)! Please let me know any omissions or additions to this list. Lovell’s First Annual Bowls and Brews took place on Saturday, November 10th. By every measure, it was a roaring success. 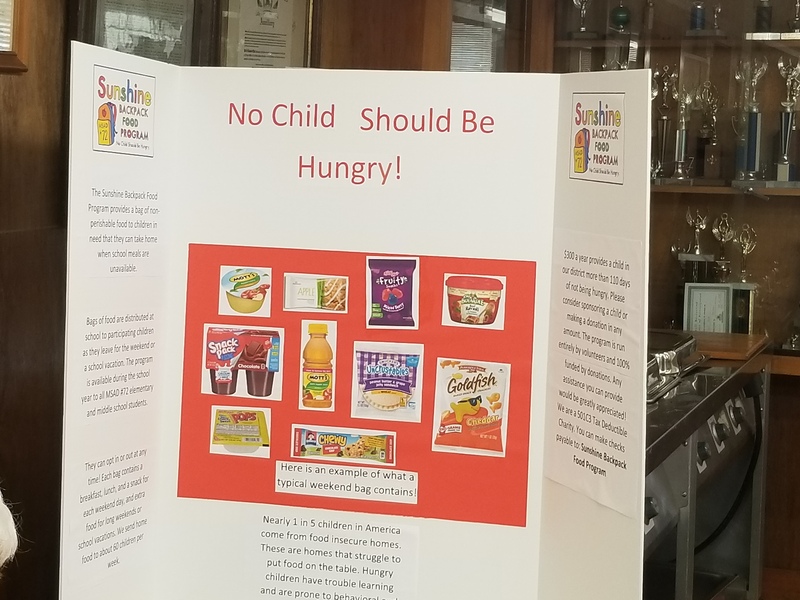 More than $1,500 was raised for the MSAD 72 Sunshine Backpack Food Program. 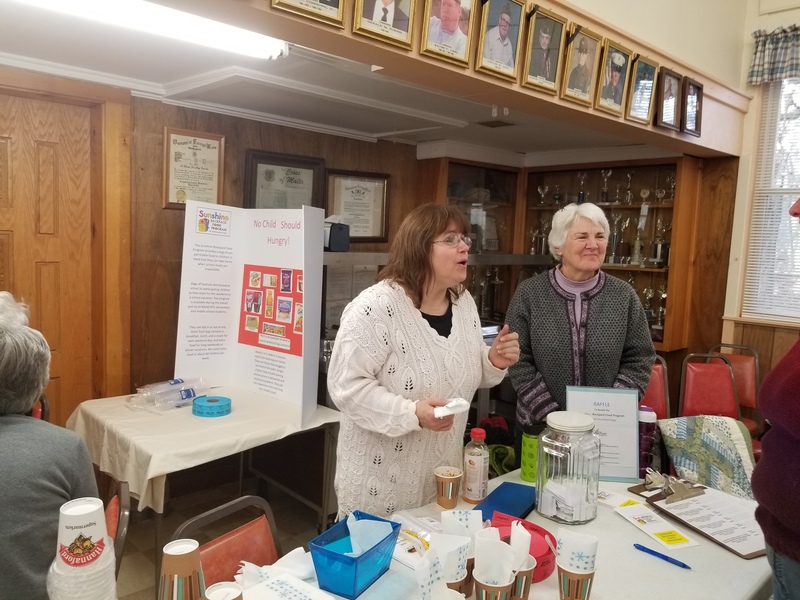 About 80 people came to the Lovell VFW Hall to enjoy 15 chilis and sample a variety of craft beers. Enthusiasm was high on both sides of the tables as people walked around trying to decide which chili was their favorite. And in between their samples, they were able to enjoy small portions of craft beer. Two top awards, aprons decorated by New Suncook School art students, were given to the first-place winners of the ‘Judges Choice’ and the ‘Peoples Choice’. The $1,500 raised will go a very long way in helping the hungry children in MSAD 72. For more information about this program and how you might be able to help, please visit their Facebook page here. A special big thank you to the following: The VFW Hall for the use of their hall, Paula Hughes for working hard to secure the local and state liquor licenses, Chris Hughes for securing beer, our three judges, Mark Moulton, Ethel Hurst and Bob Drew as well as Jeanne Bonner for organizing the judging process. Be ready for next year’s Bowls & Brews where there will be a greater selection of craft beers to sample and a new chowder division! Stan's Housing Newsletter Review all my listings as well as local and national housing trends.